This diagram is made with KTechlab (linux users), by the way. If you're a Windows user and want to simulate a circuit, try getting your hands on a student license for Multisim if your university offers this. You can also download a trial. Let's examine the transistor I used a little closer, it has 3 terminals: Collector, Emitter and Base. As the symbol indicates, the current can flow from C to E, but not the other way around from E to C (if you don't have a clue why, that arrow is called a diode and it only allows current to pass in the direction the arrow is in; but then again you probably should know that). This means that only a Direct Current (DC) is allowed to pass! Hmm, wait a second, do I know for sure that the circuit that controls the door operates on DC? No, I don't! So, I get out my multimeter and test for it (which I had to buy for this purpose, but I didn't think it would be the last time I used it, so I decided it was worth it. Those things are cheaper than you'd expect, I got one for 8 euro at a local shop I deem expensive). As it turns out, the door switch circuit operates on AC (the voltage on the switch was about 82 Volts). But, if I send a direct current (DC) in the right direction, the door opens anyway. Lucky me! I found this out while doing measurements with the "Diode and buzzer" setting on my multimeter. 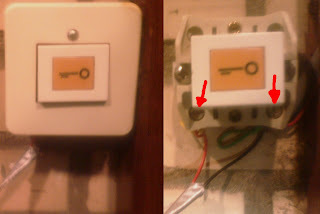 What this setting does is, that it allows a DC to pass, and when it does, the buzzer sounds to indicate that the two points are connected. (If this doesn't work for you, you need a relay instead of a transistor, which allows for AC to flow. Mirror in case of failure.) 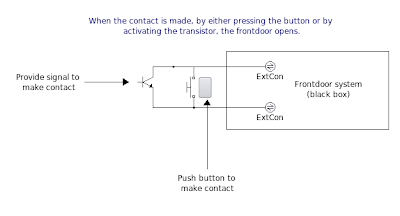 So when putting the transistor in place, I have to take notice that the DC that activates the door switch is allowed to pass. Later on, we will see that interfacing this IC to a computer, will need some precautions that are not yet shown here. If you want to learn more about transistors, Wikipedia is always a good place to start and Google (click for search results on "Transistor") is your best friend. I set up a webpage about the 2n3904 transistor if anyone is interested.